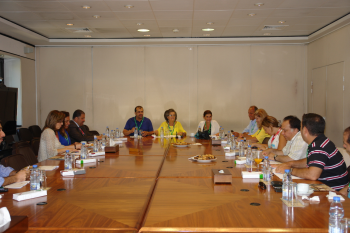 The LAU Alumni Association Board meeting was called to order by the president of the Alumni Association Board Mrs. Leila Saleeby Dagher on July 17, 2012 at LAU Beirut Campus in the presence of representatives of chapters in Lebanon and around the world. The purpose of this meeting was to discuss issues related to the welfare of the alumni and encourage more participation from the alumni. Representatives of chapters each reported on their activities during the year and suggested ideas to enhance the operations of the chapters. The Alumni Relations Office reported on the Office’s activities for the academic year 2011-2012 and reiterated the University’s gratitude to the efforts of the steering committee of the Alumni Association Board as well as the members of the executive committees of chapters for their hard work and dedication to the Alumni Association and to the University promising all the necessary support to strengthen the link between the alumni and their association.